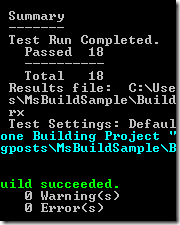 According to the blogpost about "HowTo: build solutions with MSBuild" I´m going to show you a little example about how to call MSTests. With the MSBuild command "Exec" I open the MSTest.exe with the adequate parameter. In this case the "testcontainer". Because we have to test-projects and both are loading into the OutDir as Assembly, we also need two testcontainer. Of course it´s possible to have numerous other tests. If someone has a good idea, please let me now! I know I´m not writing about something new but I had to google it so I thought you might be interested in it too.